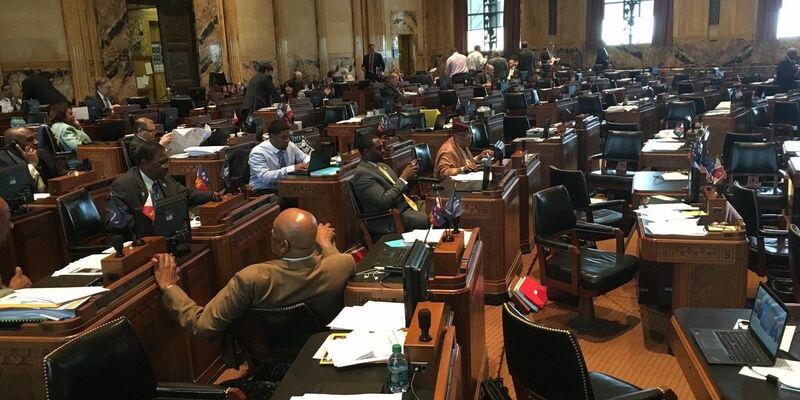 BATON ROUGE, LA (KSLA) - Lawmakers in Baton Rouge face less than 24 hours left to stabilize Louisiana's budget which is still $142 million in the hole this fiscal year ending June 30. By July 1, the start of next fiscal year, there will be a more than $1 billion hole next year. One of the last revenue-raising bills that passed the House Monday night is now being altered by the Senate to try to push the final nail into this year's deficit but it's still a big "if." Lawmakers are reportedly coming closer to eliminating a state deficit that started at more than $900 million nearly three weeks ago. The House passed House Bill 61 Monday night, authored by Monroe representative Jay Morris. Out of the four-cent state sales tax, the bill would remove one penny of sales tax exemptions which would mean no more exemptions for businesses on their utilities and machinery purchases among hundreds of other items. "That would generate about $115 million or so in a full fiscal year," Morris, (R) District 14, told KSLA News 12. But the constitutional exemptions would stay. "Food to be consumed in the home, residency utilities and prescription drugs remain in the Constitution. We can't touch that without a constitutional amendment," Morris said. On Tuesday morning, the Senate Revenue and Fiscal Affairs committee went one step further. They approved removing those exemptions from all four cents. "If we cleaned all four pennies, that would generate almost $80 million in the short-term and generate about a half a billion dollars in the long-term," said Senator JP Morrell, (D) District 3. "That would get us almost out of this year's crisis and halfway through next year's crisis." But now it has to pass the Senate and the House before going to Governor John Bel Edwards, a feat lawmakers are unsure about. "I suspect that the House would not go along with it," Morris said. "It was difficult to get it out of the House with one cent, so it'll go to a conference committee." That means backroom negotiations on the final version of the bill if it's rejected. "Until both sides come to the table with the willingness to compromise and not to make demands, I think we'll probably get stuck where we are now, which is at opposite ends of the spectrum," said Morrell. A position members of both the House and the Senate said they don't want to be in: Stuck with only a day left to solve the budget. Both the House and Senate adjourned Tuesday evening without voting on HB 61. Backroom conference committees will now meet to negotiate the final forms of any revenue-raising bills that remain on the table. This special session is set to end at 6 p.m. Wednesday. The Senate is set to convene at 9 a.m. that day and the House is set to convene at 10 a.m. Even if HB 61 is passed, lawmakers said cuts to higher education and healthcare could become unavoidable. "I have not seen any scenario where we don't leave here with cuts to higher education and healthcare," Morrell told KSLA. "Right now, we're simply trying to mitigate how damaging those cuts are going to be." Copyright 2016 KSLA. All rights reserved.